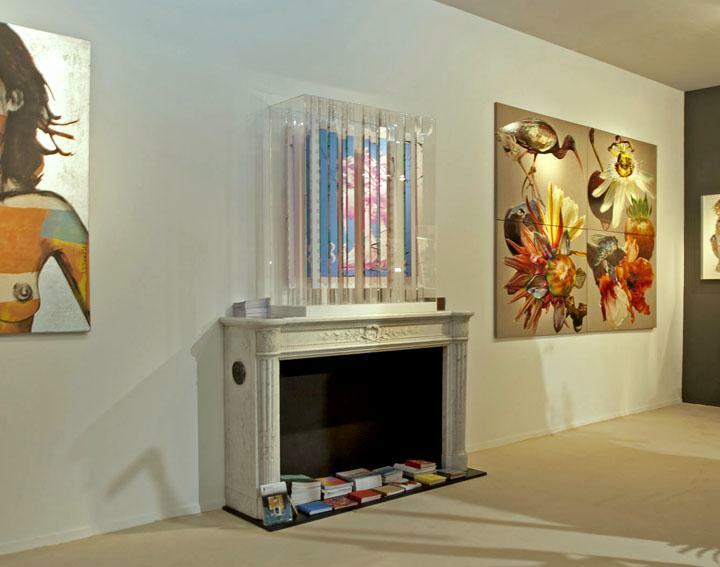 In September 2012 Thornhill Galleries were proud to collaborate with the Rebecca Hossack Art Gallery and contemporary artist Piers Bourke to display an antique French fireplace at the Lapada Art and Antiques Fair in Berkeley Square, London. The five day event is one of the UK’s largest antiques fairs, attracting thousands of industry professionals and private clients from across the globe. Everything from contemporary fine art to antique fireplaces to European porcelain can be viewed under one roof which is home to over 100 exhibitors. Prior to the event, Thornhill Galleries worked closely with artist Piers Bourke to establish the correct tone for the collaboration. The aim was to highlight how elements of the contemporary and traditional can work together. As can be seen in the accompanying photos, Piers’ piece was a six sided perspex case with multiple photographic images of the Queen, mounted on perspex with acrylic paint and ink. This was complemented with a fine quality 19th century French fireplace in the Louis XVI style. The frieze carved with laurel leaves tied with centre ribbon, bordered by strung pearl beading, the jambs with half fluted columns inlaid with bellflowers, surmounted by carved acanthus leaf capitals. Should you have any questions about this or any similar an antique mantels on our website please don’t hesitate to get in touch.